Тип урока: урок обобщения знаний по теме « Семья» Цели урока: Учебные: развитие навыков монологической и диалогической речи, расширение лексического запаса, развитие умения понимать иноязычную речь и реагировать на нее, активизировать в речи лексический и грамматический запас, расширение знаний о стране изучаемого языка. Развивающие: развитие критического мышления, развитие творческих способностей, расширение кругозора, развитие памяти и сообразительности. Воспитательные: создание условий для формирования способности к критическому мышлению, формирование потребности и способности к сотрудничеству и взаимопомощи в группе, воспитание уважения к стране изучаемого языка и познавательного интереса у учащихся к культуре англоязычных стран. Технология: проектная методика, элементы технологии критического мышления. 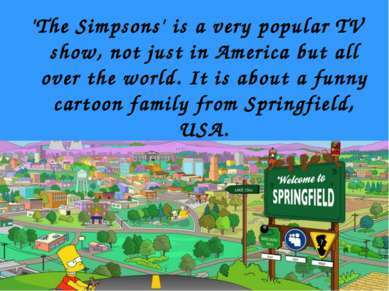 Оборудование: мультимедийный проектор, презентации: «The Simpsons»,« My Family»,текст для чтения,CD player, календари. Ход урока. 1.Начало урока. Организационный момент. Мозговой штурм Teacher: Hello, children. I` m glad to see you .How are you? Look at your calendar. What date is it today? Circle it in your calendars. What day of the week is it today? Draw a face. If you feel well , draw a happy face. If not, draw a sad one. 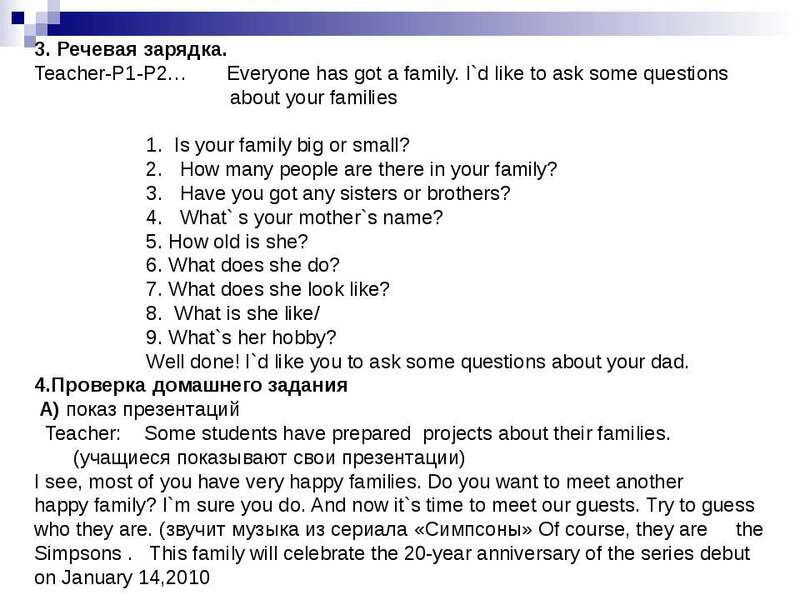 Today we are going to speak about families ,but not only about your families. Before this, let`s revise some words for this topic. Name as many words as you know . (P1-P2-P3-P4-P5…) 2. Фонетическая зарядка. Teacher: You know a lot of poems about family. Let`s recite some of them. Father, mother, sister, brother Hand in hand with one another My family My mum is like a bee Because she`s as busy as she can be My dad is like an ox Because he`s strong and he can box My sis is like a mouse Because she`s quite in the house My granny is like a snail Because she`s slow and can`t send an email But I`m like a mule Because I`m stubborn but really cool! 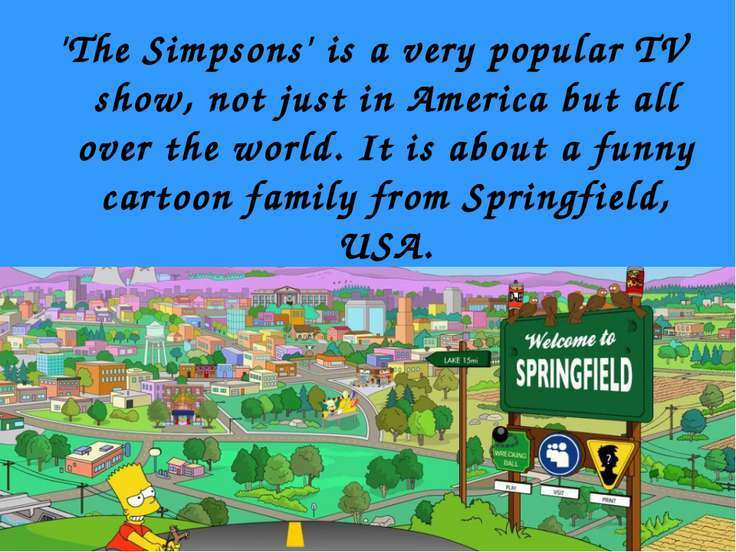 'The Simpsons' is a very popular TV show, not just in America but all over the world. It is about a funny cartoon family from Springfield, USA. Marge Simpson is the mother of the family. She is 38 years old. She is tall and slim and her hair is blue! She can cook well and she is very patient and kind. She is afraid of flying. 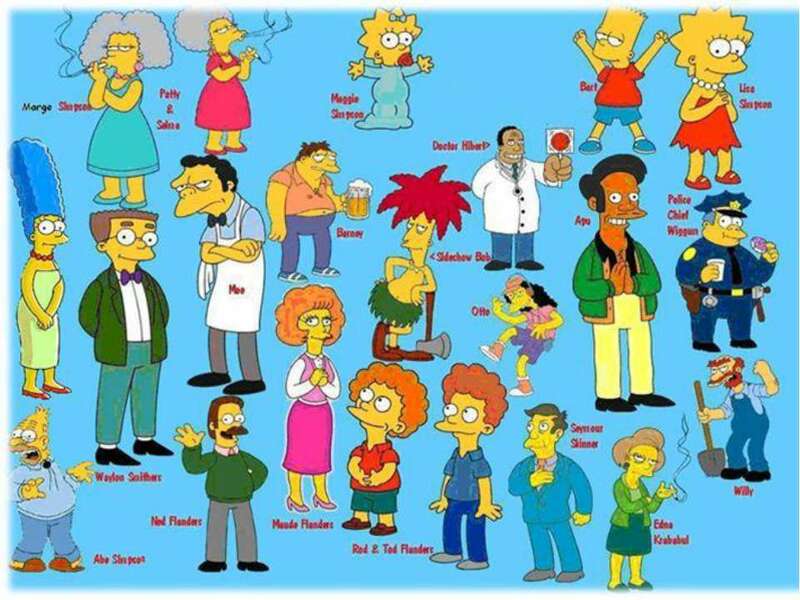 Homer Simpson is the father of the family. He is 39 years and is tall and fat. 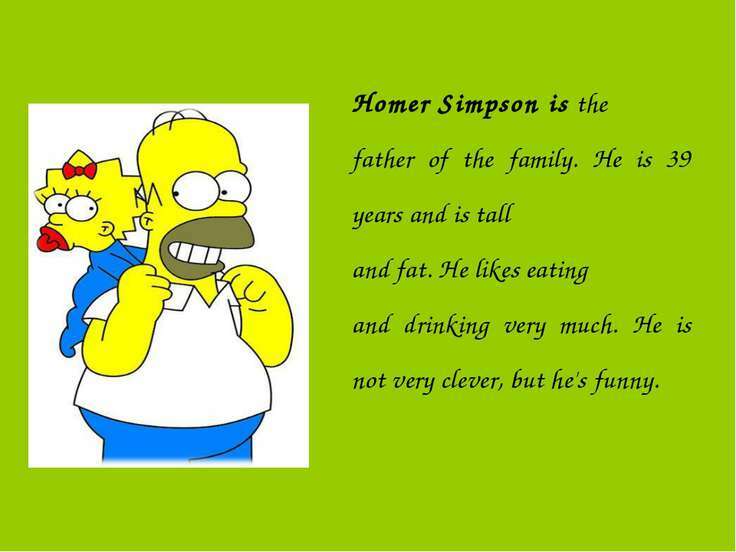 He likes eating and drinking very much. He is not very clever, but he's funny. 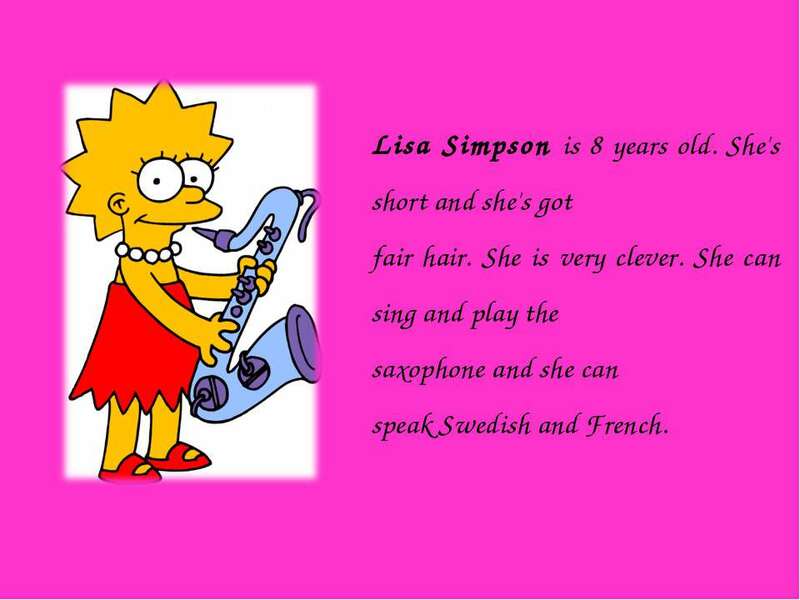 Lisa Simpson is 8 years old. She's short and she's got fair hair. She is very clever. She can sing and play the saxophone and she can speak Swedish and French. Bart Simpson is 10 years old. He is short with fair hair. He is naughty and noisy. 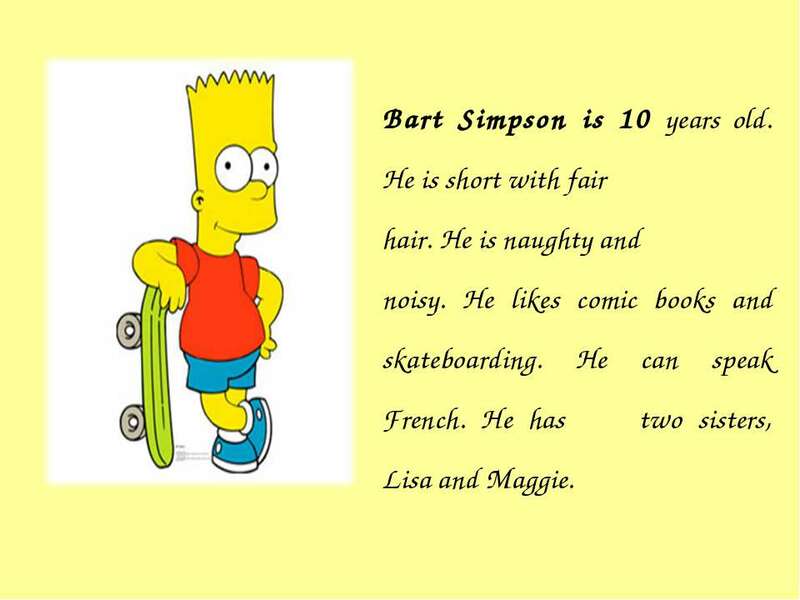 He likes comic books and skateboarding. 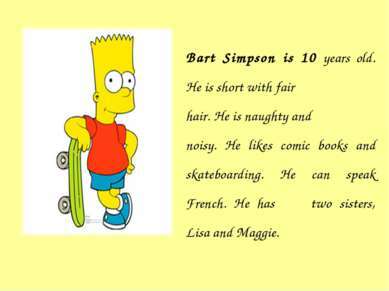 He can speak French. He has two sisters, Lisa and Maggie. Teacher: I`d like to check your memory. A) Guess who? He is tall and fat. 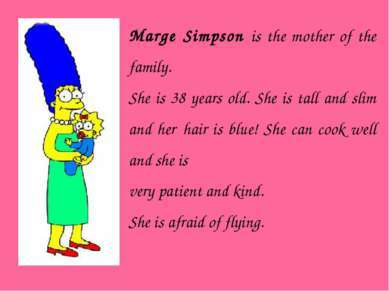 (Homer Simpson) Her hair is blue (Marge) He likes comic books and skateboarding. 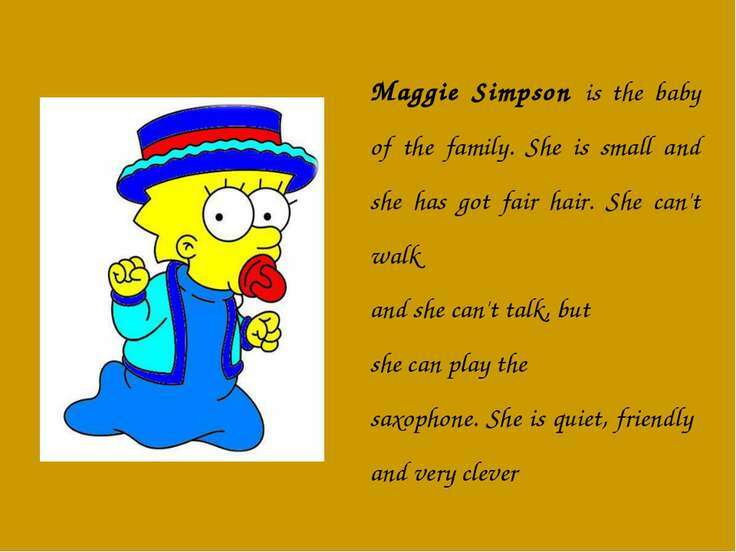 (Bart) They can play the saxophone(Lisa and Maggie) She`s got fair hair. (Maggie) B) Correct the sentences Homer Simpson is the mother of the family Lisa is 10 years old Bart likes eating and drinking. The Simpsons is a sad family The Simpsons is from Russia 5.Физминутка Игры на внимание и реакцию Песня Head and Shoulders 6. 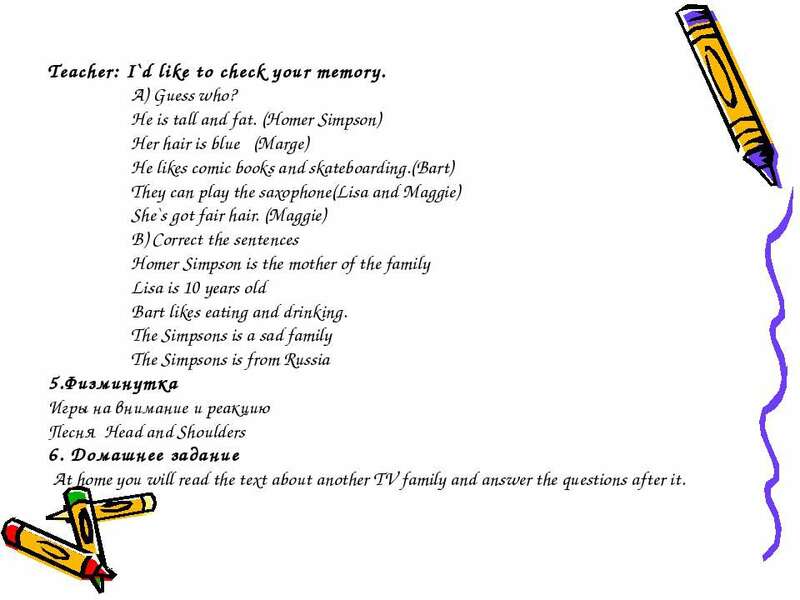 Домашнее задание At home you will read the text about another TV family and answer the questions after it. The Flintstones lives in prehistoric town Bedrock. This is a happy family of three. Fred Flintstone, Wilma Flintstone and their daughter Pebbles. The Flintstones has a pet called Dino. It’s very loyal and loving pet. Betty and Barney Rubbles are their friends. They have a son called Bam-Bam. He is the world strongest kid! These families are very joyful, funny and happy. a) Who is the father? 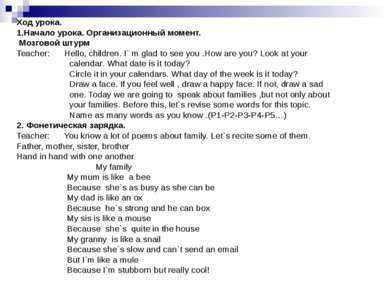 b) Who is the mother? 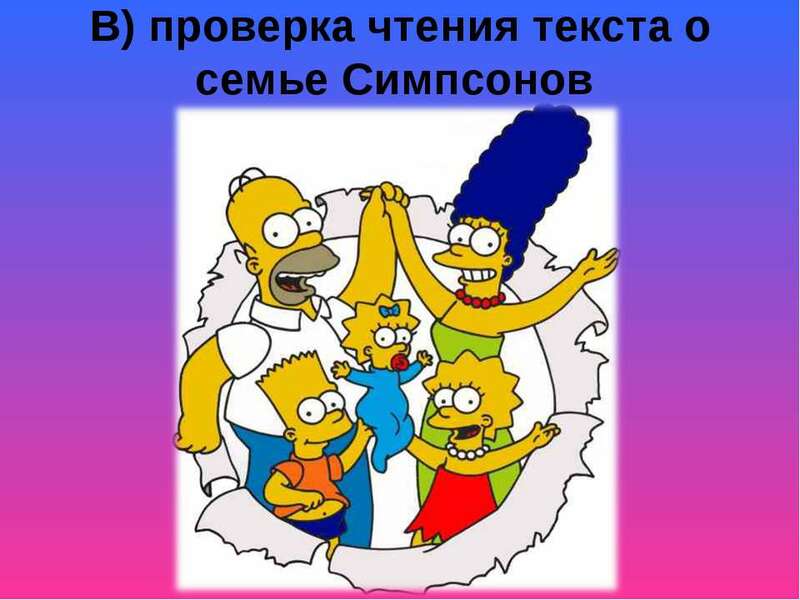 c) Who is the daughter? d) What is the pet name? 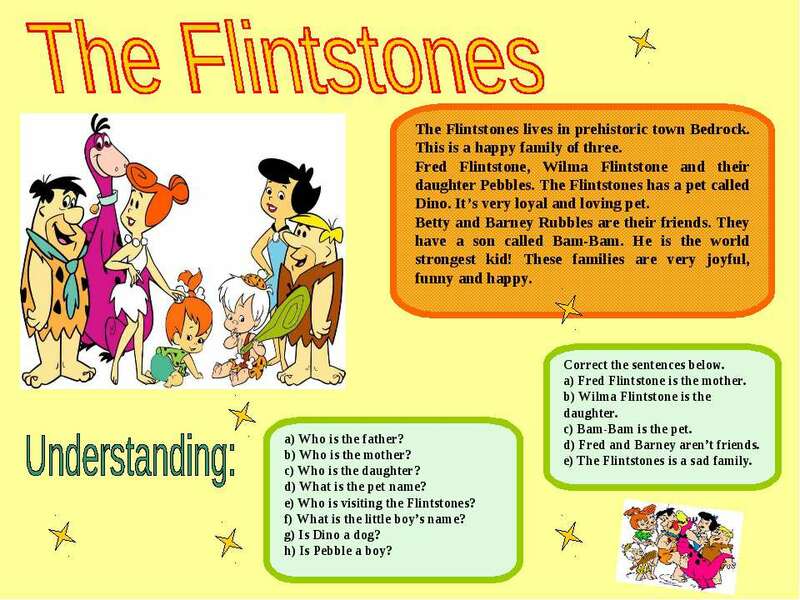 e) Who is visiting the Flintstones? 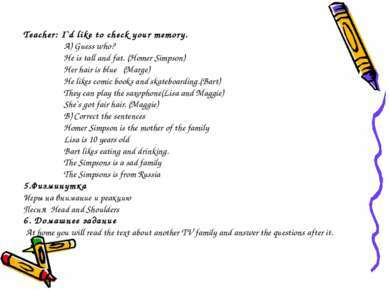 f) What is the little boy’s name? g) Is Dino a dog? h) Is Pebble a boy? Correct the sentences below. 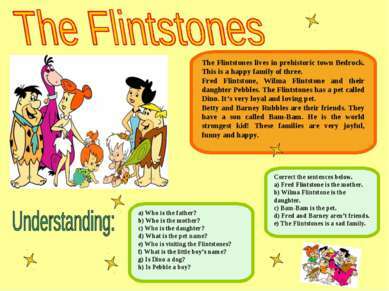 a) Fred Flintstone is the mother. b) Wilma Flintstone is the daughter. c) Bam-Bam is the pet. d) Fred and Barney aren’t friends. e) The Flintstones is a sad family. 7. 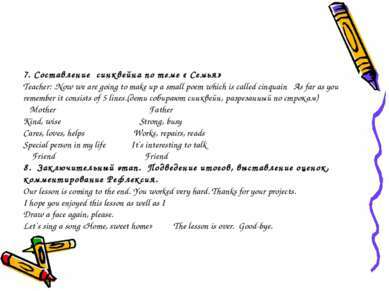 Cocтавление синквейна по теме « Семья» Teacher: .Now we are going to make up a small poem which is called cinquain As far as you remember it consists of 5 lines. 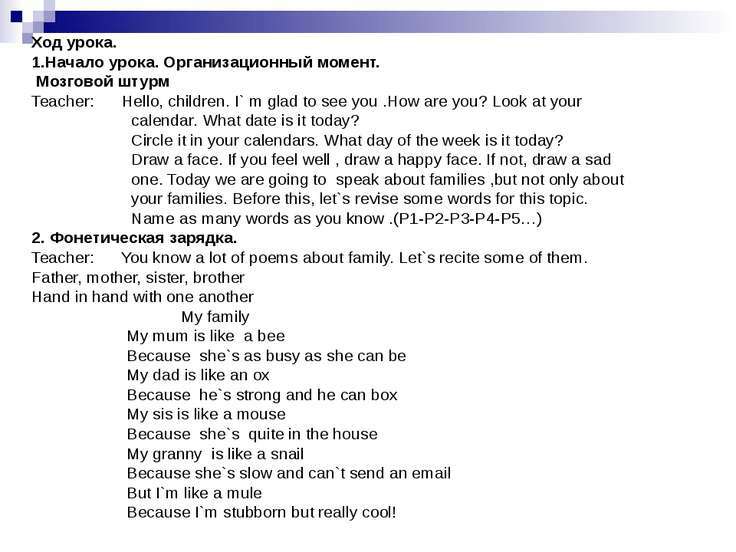 (дети собирают синквейн, разрезанный по строкам) Mother Father Kind, wise Strong, busy Cares, loves, helps Works, repairs, reads Special person in my life It`s interesting to talk Friend Friend 8. Заключительный этап. Подведение итогов, выставление оценок, комментирование Рефлексия. Our lesson is coming to the end. You worked very hard. Thanks for your projects. I hope you enjoyed this lesson as well as I Draw a face again, please. Let`s sing a song «Home, sweet home» The lesson is over. Good-bye.